Jean Fisherstudied zoology and fine art, later becoming a freelance writer on contemporary art and post-coloniality. During the 1980s whilst in New York, she was a regular contributor to Artforum International, co-curated exhibitions of contemporary Native American art with the artist Jimmie Durham and taught at various times in the School of Visual Arts, State University of New York at Old Westbury and the Whitney Students’ Independent Study Program. Fisher is the former editor of the international quarterly Third Text, and the editor of the anthologies, Global Visions: Towards a New Internationalism in the Visual Arts (1994), Reverberations: Tactics of Resistance, Forms of Agency (2000) and, with Gerardo Mosquera, Over Here: International Perspectives on Art and Culture (2004). 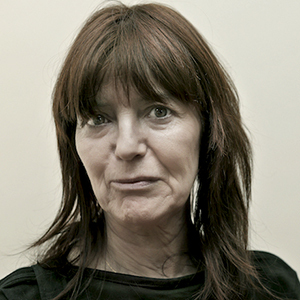 A selection of her essays, Vampire in the Text, was published by Iniva in 2003. She has written on the work of numerous artists, most recently Francis Alÿs, Sonia Boyce, James Coleman, Jimmie Durham and Willie Doherty, and has contributed essays to the catalogues to the Venice Biennale (1997), Johannesburg Biennale (1997), Carnegie International (1999), documenta11 (2002) and the Sharjah Biennial (2005). She currently teaches at the Royal College of Art, London, in the program Critical Studies for the MA Curating Contemporary Art (‘The European Imaginary and its Others’).